Let us now ponder the noteworthy parallels than can be drawn between the careers of Joseph Mallord William Turner and Jackson Pollock. Both artists lived and worked at the zenith points of their respective empires, those being the British victory over the Bonapartist challenge in the first two decades of the 19th century, and the American-led victory over the Axis powers 14 decades later. The careers of both artists owed much to the fervent advocacy of two great critics who both staked and built their own reputations on claims made about the historically transformative importance of their work. Respectively, those critics were, of course, John Ruskin and Clement Greenberg, and in both cases, their claims pointed to how each artist had synthesized the accomplishments that preceded them, while also celebrating the fact that each had made the major stylistic innovation of their respective historical moment. In both cases, those innovations came by way of extremely unorthodox techniques that placed the powerful alchemy of paint in the forefront of their practice. Most importantly, there is the way that these two artists can be seen as painterly bookends for that art historical project called Modernism, with Turner occupying the alpha point and Pollock the omega. This observation is one of many borne out in the de Young’s current exhibition titled J.M.W. Turner: Painting Set Free, which originated at the Tate Britain and then traveled to the Getty Museum this past spring. 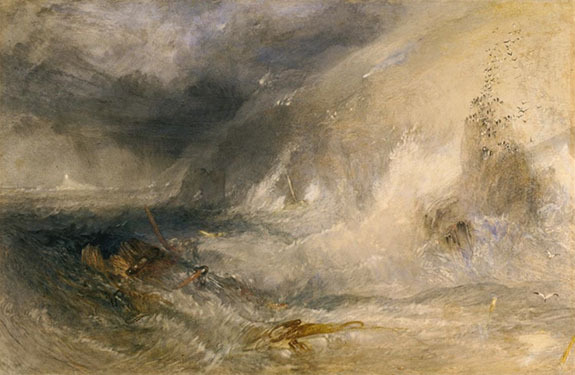 Its focus is on the last 15 years of Turner’s career (and life), with the earliest work dated around 1834. Naturally, a great many of the included oil paintings and watercolors come from the collection of the Tate Britain, which holds the trove of works that Turner bequeathed to England prior to his death in 1851. These selections are complimented by additional works from several other collections, adding up to an extremely rich viewing experience, possibly the best painting exhibition seen in northern California for more than a decade, although I would say that the Venetian Painting exhibition held at the de Young in 2011 was just as rare and just as satisfying. 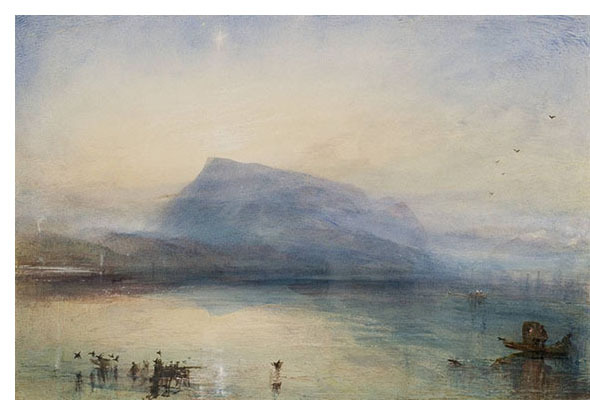 The exhibition under consideration here is organized around clusters of subject matter rather than strict chronology, with special emphasis placed on Turner’s watercolors, many of which are perfectly stunning. The very best of these took the environs of Lake Lucerne as their subjects, seizing on characteristic landmarks such as mountain peaks to establish just enough compositional solidity to anchor the work’s delicate play of evanescence. For example there are four watercolors that look at Mt. Rigi from different vantage points and different times of day, including the famous The Blue Rigi, Sunrise (1842), which is one of most revered watercolors in the entire history of painting, and deservedly so. Mt. Rigi also figures in one of the oil paintings displayed nearby, the one titled Sunset from the Top of the Rigi (1844), one of the later works where descriptive fortitude gives way to the fugitive play of light, color and atmosphere. It is one of many works that supports the claim that Turner was in fact the first impressionist (or to be more precise, an impressionist before Impressionism), a claim that assumes Claude Monet had encountered Turner’s work during his 1870-71 stay in London during the Franco-Prussian War. By that time, much of Turner’s famous “bequest to the nation” was on public view. Therefore, it seems highly likely that Monet would have seen it, as we know that both he and Camille Pissarro viewed and discussed Turner’s work in 1870.
rare for Turner, but his treatment of the Bridge of Sighs captures the color and light of late evening in a way that emphasizes the richness of cool colors. The other Venice-themed works are in oil and were executed and exhibited between 1842 and 1846. 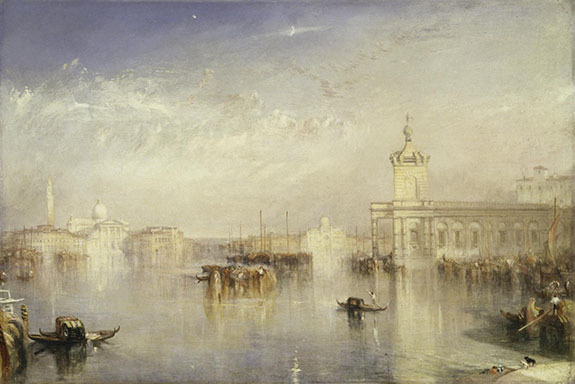 The Dogana, San Giorgio and Citella from the Steps of the Europa (1842) evinces a scenic bent that seems responsive to the work of Canaletto and his followers, while the one titled St. Benedetto Looking toward Fusina (1843) places the interplay of mist and light into the foreground of the work. a widely different attention to detail in this works: at some junctures the clouds seem to be very precisely rendered, while at others they seem to be functions of slap-dash paint application. I have never seen a painting that is more convincing in its capture of the effects of shimmering light. 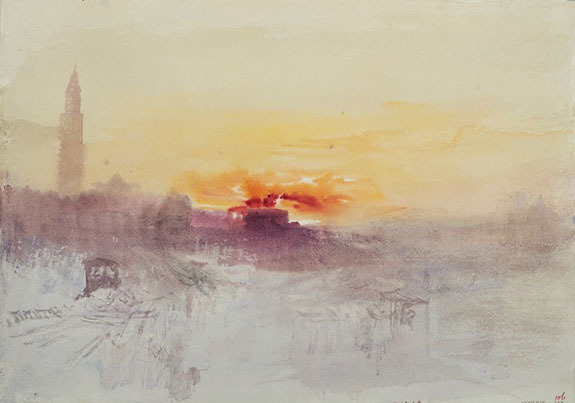 Ruskin’s comment that Turner’s paintings are “visions to be beheld rather than pictures to be looked at” pertains here, and all throughout the exhibition. Monster (1845), which is as demonic an image as anything painted in the history of British art, even including the work of William Blake. If anything, this painting resembles some of more terrifying images painted half a century later in America by Albert Pinkham Ryder, and in France by Symbolists such as Odilon Redon. Indeed, for Turner, the vast expanse and depths of the ocean could be a hoary place, and for that reason, all the more fascinating. My least favorite works on the exhibition still bear some remark—they are works of what could be called the exotic or fantastic type. 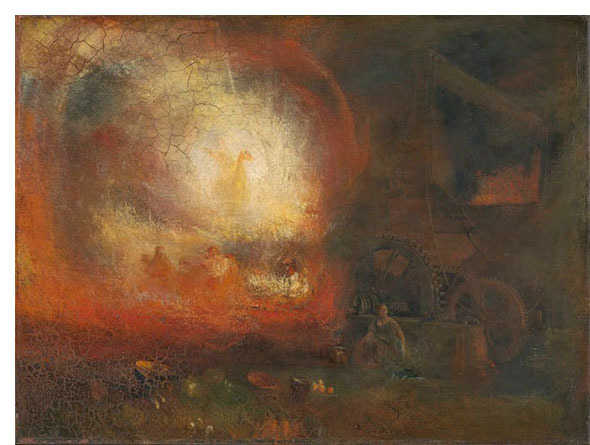 These tend to be renditions of mythological or historical themes, and it is of some interest that Turner’s paintings make no distinction between the way that history of mythology should be treated—both suborned to saturated atmospheres and idealizing illumination. 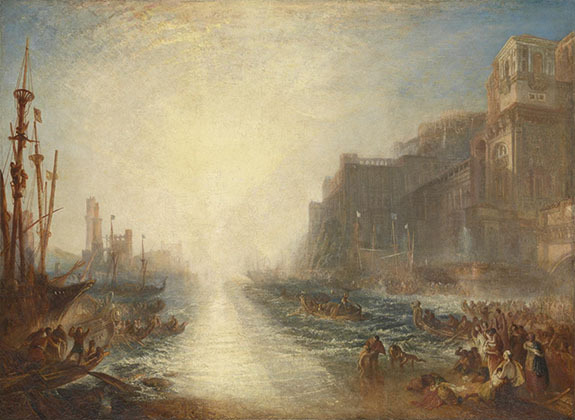 One of these is titled Regulus (originally painted in Rome in 1828 and subsequently reworked), showing disembarking ships arriving ant an ancient city. A blindingly bright yellow sun is at the center of the composition, while at the left is the ancient city of Carthage. One of the small figures is Regulas, a captured Roman General who was used as an emissary by Hannibal, only to return with bad news, for which he had his eyelids cut off. Legend has it that he went blind from the bright North African sun, which adds some special meaning when we look at the blinding light of the painting. There was another work of this ilk that seemed remarkable: The Hero of One Hundred Flights. Like Regulus, it was an earlier painting (from 1808) that had been reworked many years later (in 1847), showing an iron forge with billowing clouds of lurid red smoke. At the center of the composition stands a statue of Wellington whose celebrity status had not yet waned four decades after Waterloo. As stunning as this exhibition is, it still has a few unfortunate stumbling blocks. The fine catalog that accompanies it illustrates several works that were only included in the Tate presentation, and the exclusion of Turner’s Rain, Steam and Speed: The Great Western Railway (1844) leaves an important gap. It is Turner’s ode to a future defined by machines, a proto-Futurist turning away from things pastoral and toward the mercilessness of industrial power. 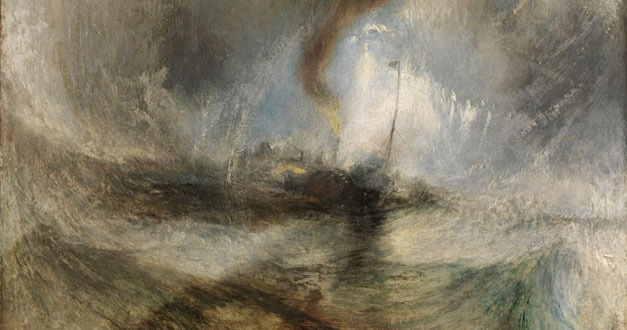 This is not to say that Turner didn’t register the effects of industry in other works; many of his marine paintings show the billowing smoke stacks of steamships, validating the claim that the shimmering plays of light and atmosphere in many of his other works are related to the air pollution produced by the burning of coal. 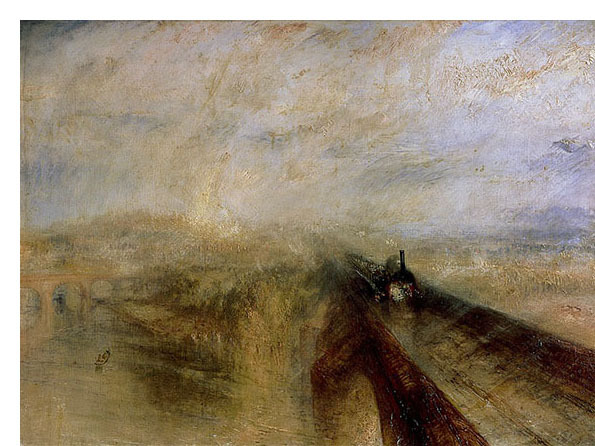 But Rain, Steam and Speed is Turner’s most forward-looking painting, perhaps the very first work in the history of art to embrace the idea of a mechanical sublime. Rain Steam and Speed, 1844, a painting not included in this show. was well schooled in the subject. 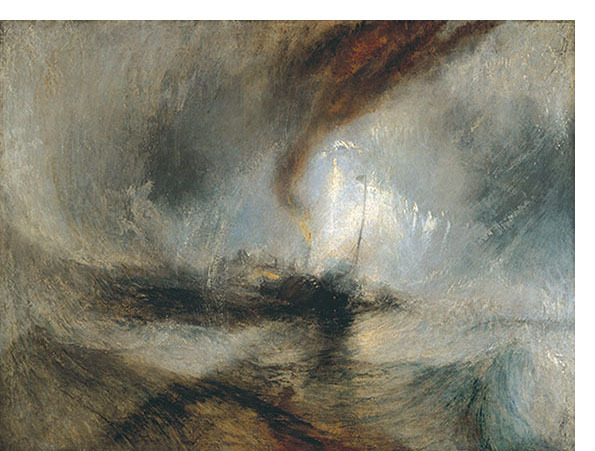 But whether or not Turner was aware of those poets’ work, we still have to ask: to what degree did literary Romanticism influence English painting? Besides the work of Turner and John Constable, was there a broad-based movement in painting that could compare to the French Romantic movement that took place during the same time as the final 15 years of Turner’s career? Clearly, Turner’s historical and mythological paintings seem to bespeak a great deal of continental influence — one sees echoes of Delacroix, Jean-Léon Gérôme, Claude Lorrain, as well as others emanating from Germany, such as Caspar David Friedrich or Konrad Eberhard. But was there something very different going on? Despite whatever claim one might want to make about the complicated relation of Turner’s work to Romanticism (for starters, his politics were of the type that would never embrace the idea of “liberty leading the people”), the important point is that Turner did something with that influence, and that thing is what we see in this exhibition. It captures the precise hinge moment where the radical subjectivity of Romanticism pivots to a new place, where artists dedicated themselves to exploring the tangible relationship between experience and the materials that would allow them to capture those experiences.